At some point in everyone’s life, we have experienced that panic-inducingfeeling of working under pressure. Nine times out of ten, we fail—both in accomplishing the task and in managing or overcoming pressure. Most people suffer from the paranoia of failing and being intimidated or overwhelmed with what seemed to be an unconquerable assignment. Pressure always gets the best of us and this fact is not to be ashamed of. Nobody likes working hurriedly and harried, with decisions made without the luxury of deliberating. 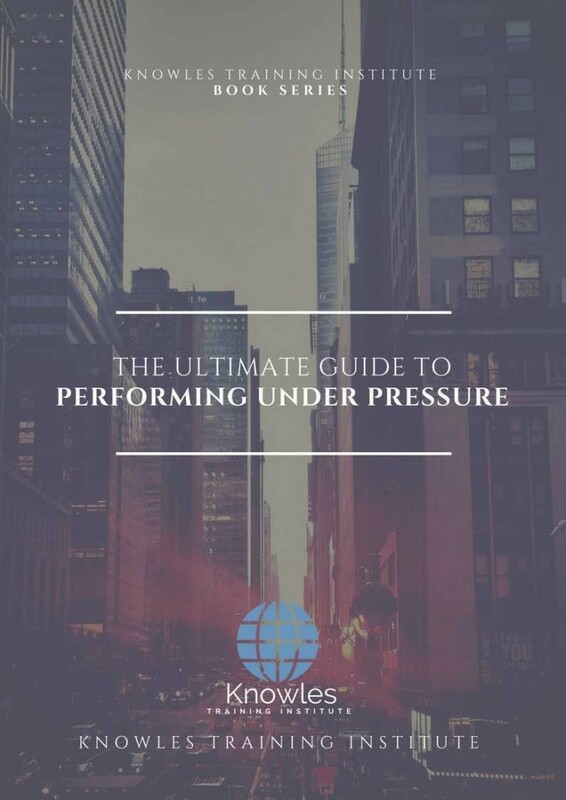 A famous book about dealing with pressure entitled “Performing Under Pressure: The Science of Doing Your Best When It Matters Most” by Hendrie Weisinger and J.P. Pawliw-Fry explains that the best way to deal with pressure is to learn to alleviate its choking hold on you. While pressure, in many aspects of life, is unavoidable, there are ways to manage them and come out the better. This course will provide the participants with a deeper understanding of how pressure affects the body and the quality of work as well as the simple ways of dealing with it. This Performing Under Pressure workshop is ideal for anyone who would like to gain a strong grasp and improve their Performing Under Pressure. The duration of this Performing Under Pressure workshop is 1 full day. Knowles Training Institute will also be able to contextualised this workshop according to different durations; 2 full days, 1 day, half day, 90 minutes and 60 minutes. What or who are the sources of pressure in the work environment? 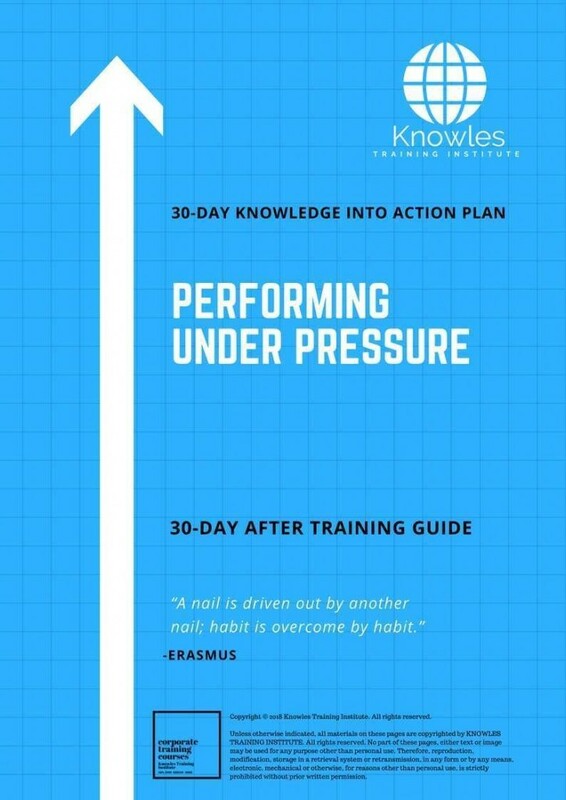 How can pressure affect your performance and decision making? How can you keep your calm under pressure? 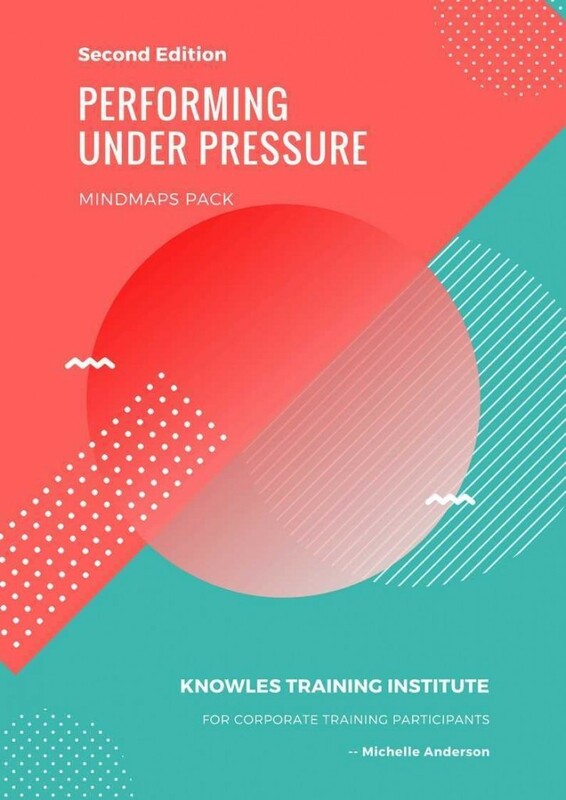 How can you remain focused and mindful when under pressure? What happens when you succumb to pressure? What benefits can you get from experiencing working under pressure? 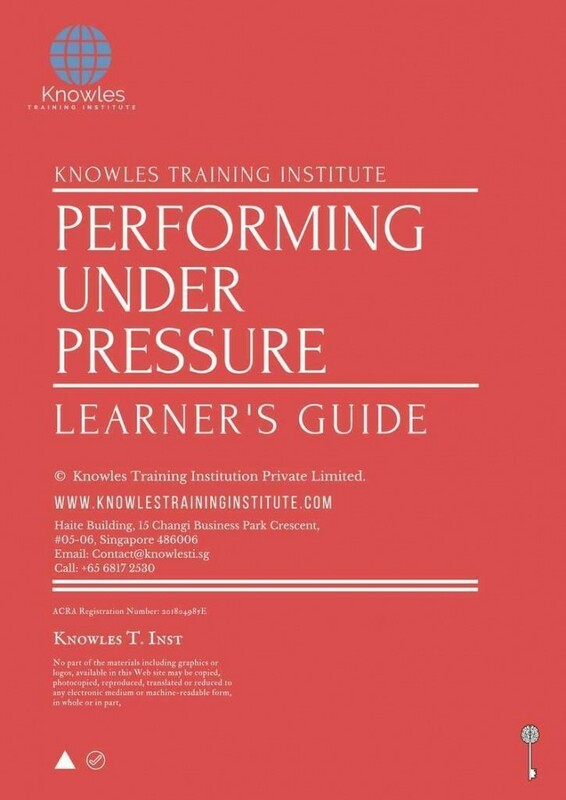 There are 3 pricing options available for this Performing Under Pressure training course. 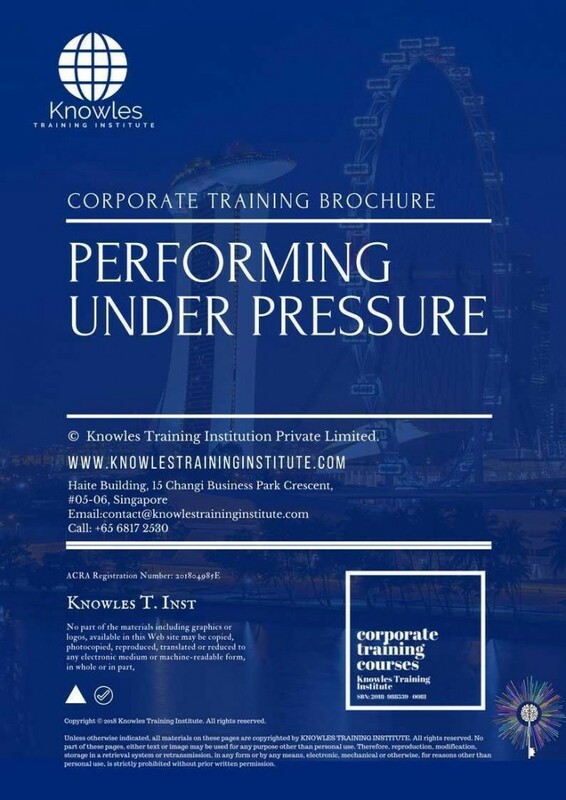 Course participants not in Singapore may choose to sign up for our online Performing Under Pressure training course. 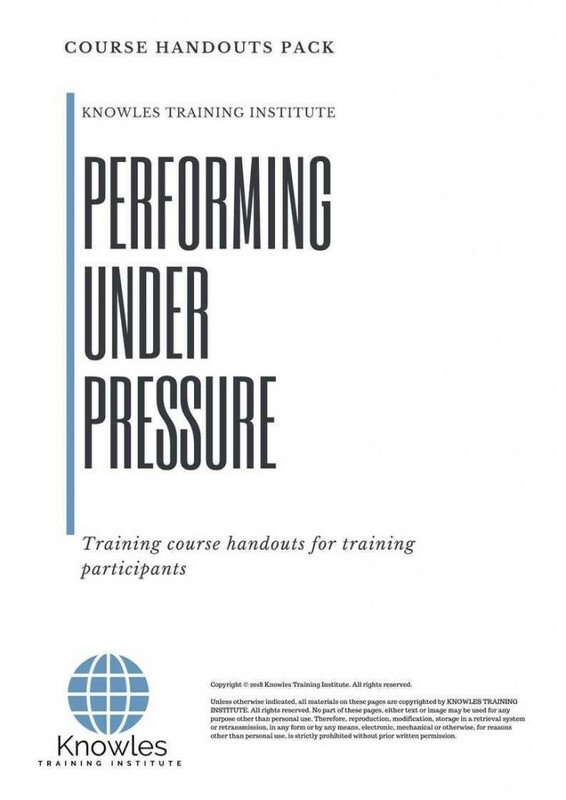 Request for this Performing Under Pressure course brochure. Fill up the short information below and we will send it to you right away! Register For This Performing Under Pressure Course Now! 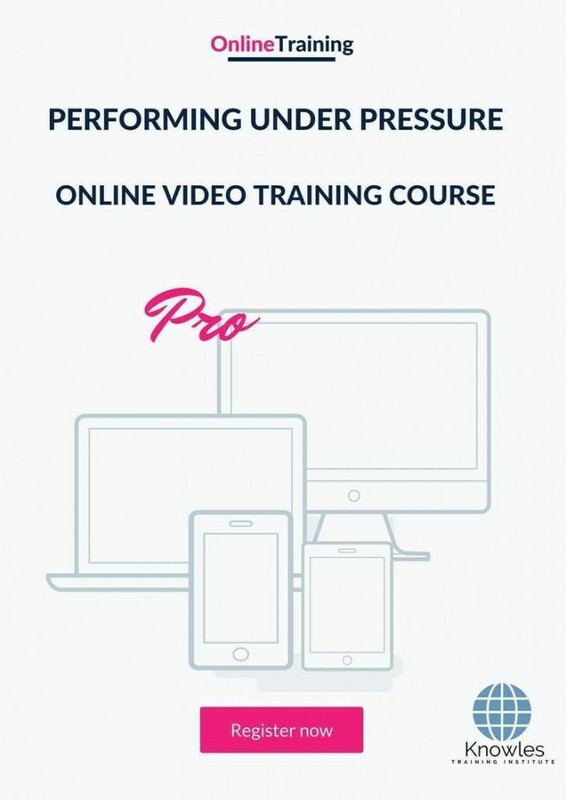 Share This Performing Under Pressure Training Course! Performing Under Pressure course, workshop, training, class, seminar, talk, program, programme, activity, lecture. Performing Under Pressure courses, workshops, classes, seminars, talks, programs, programmes, activities, lectures in Singapore. Performing Under Pressure improvement tips, Performing Under Pressure techniques, improve Performing Under Pressure, improve Performing Under Pressure games, Performing Under Pressure improvement exercises, improve Performing Under Pressure power, how to have good Performing Under Pressure, how to have good Performing Under Pressure in studying, how to build up your Performing Under Pressure, how to improve Performing Under Pressure how to improve Performing Under Pressure course in Singapore. Enhance, boost, build up, enlarge, heighten Performing Under Pressure course in Singapore. Increase, intensify, raise, reinforce, strengthen Performing Under Pressure. 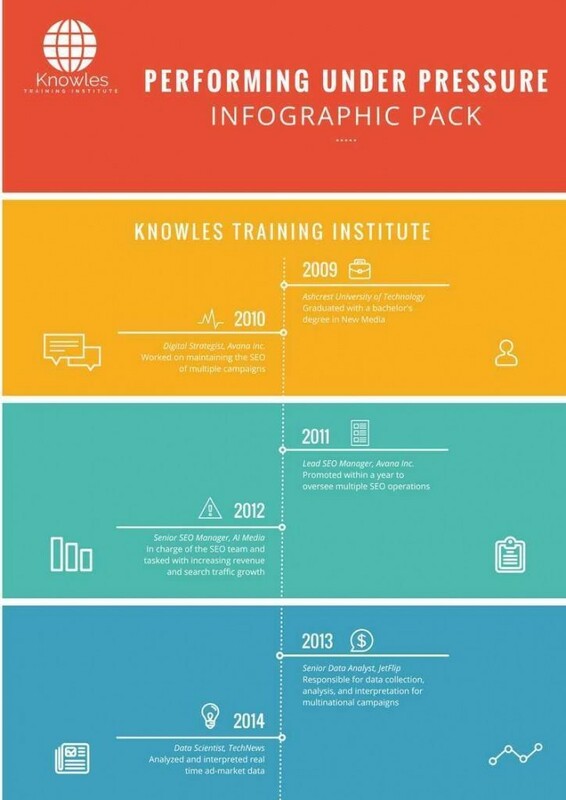 Upgrade, amplify, boom, elevate, exaggerate, magnify, grow, gain Performing Under Pressure. Develop Performing Under Pressure, multiple, power up, beef up, bolster, establish, extend Performing Under Pressure. Invigorate, restore, step up, toughen, empower, fortify, regenerate Performing Under Pressure. Rejuvenate, renew, escalate, expand, maximize Performing Under Pressure. Powerful, mighty, impressive, competent, great, excellent, exceptional Performing Under Pressure in Singapore. Superb Performing Under Pressure. Super, superior, strong, solid, active Performing Under Pressure training courses and workshops in Singapore. Performing Under Pressure enhancement, booster, building up, enlargement, heightening, increment, strengthening, amplification. Performing Under Pressure magnification, growth, development, power, empowerment, regeneration. Performing Under Pressure rejuvenation, development, escalation, expansion. 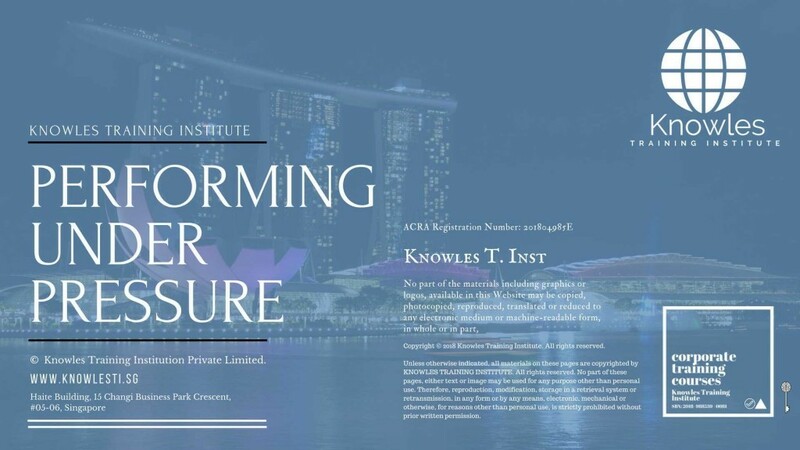 Performing Under Pressure maximization, power training courses & workshops in Singapore.